Jan Wijnants is documented on various occasions in his native city, as well as in Rotterdam in 1653 and Amsterdam in 1660 where he remained until his death. Wijnants focused on dune landscapes based on the area around Haarlem, creating compositions articulated by paths and roads with travellers, riders and peasants walking along with their animals or possessions or resting by the roadside. This is a type of composition frequently found in his oeuvre but always with small differences that make his compositions interesting and innovative. Wijnants’ earliest works date from slightly before 1650 and generally depict farms or large brick huts surrounded by dense woodland. During this period the artist collaborated with the painter Dirck Wijntrack who painted the animals and some other elements in his compositions. 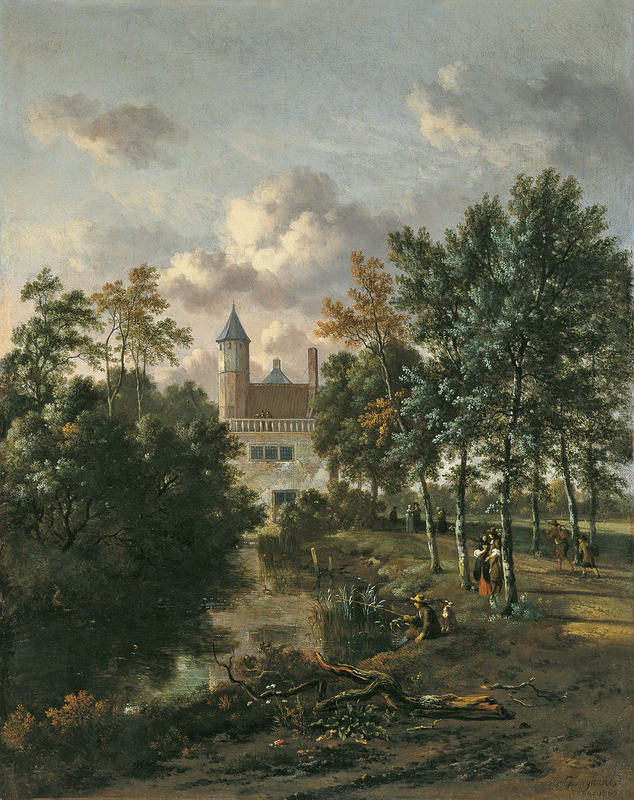 At the end of the decade Wijnants modified his style and included a series of elements derived from other landscape painters such as Jacob van Ruisdael. From this point onwards his rustic houses are located further back in the pictorial space, becoming smaller and fusing with the background planes. In addition, Wijnants located stumps of trees, gnarled trunks of fallen trees or dry, twisted ones in the foreground, motifs derived from Ruisdael and illuminated with a glowing light. The subject of this panel, as Gaskell noted, is unusual within Wijnants’ oeuvre. The view opens on the left with a stream that leads directly to the plain façade of an imposing castle. On the right bank and following the course of the water is a road framed on either side by a line of trees with figures walking along it towards the castle. This side provides a marked contrast with the other bank, which is concealed by a dense mass of trees, shrubs and undergrowth. A feature that would become characteristic of his work in the 1670s is the dry trunk of a gnarled tree located in the foreground. This composition has been related to the work of another artist who collaborated with Wijnants in Amsterdam, namely Jan Hackaert, in particular Avenue of Birch Trees in the Rijksmuseum, Amsterdam, in which Hackaert depicts an area of water on the right that is followed by the curve of a path lined with birch trees. Proceeding along the avenue is a lively group of riders, hunters with their dogs and passers-by. With respect to the present canvas, it has been suggested that Adriaen van de Velde painted the figures. The present work was auctioned at Christie’s in London in 1819 and seems to have belonged to Matthew Mitchell. It was later acquired by Charles de Bourbon, duc de Berry, passing to his heirs by inheritance. It is then recorded with various dealers in London, Paris and The Hague before entering the collection of Edward Carter in Los Angeles. It was acquired for the Thyssen-Bornemisza collection in 1977 through the Nystad gallery in The Hague.